When you are at Ibiza and you like to explore the island than you have to visit Es Vedra. It’s a uninhabited rock island at the west coast of Ibiza. It’s mysterious and the place that gives Ibiza her magic as they say. And that’s exactly the feeling you get when you are looking at it. There’s a lot of legends and myths about this island. The island is part of Cala d’Hort nature reserve. It belongs to a group of rock islands. Next to Es Vedra there’s a smaller island called Es Vedranell. Es Vedra is 400 metres tall and it’s made of limestone and a high concentration of metal and minerals and it’s a magnetic spot. It’s the third most magnetic spot of the world. When you look at it, you think you only see some stone, but the truth is, that there are 166 plant species living at the island. That makes it one of the most botanic areas of the Balearic islands. Different kinds of birds and lizards are living at the island, one kind of the lizards has a blue back and only lives at Es Vedra. Until 2016 there were wild goat, but these were slaughtered by the local government to protect the fauna of the island. 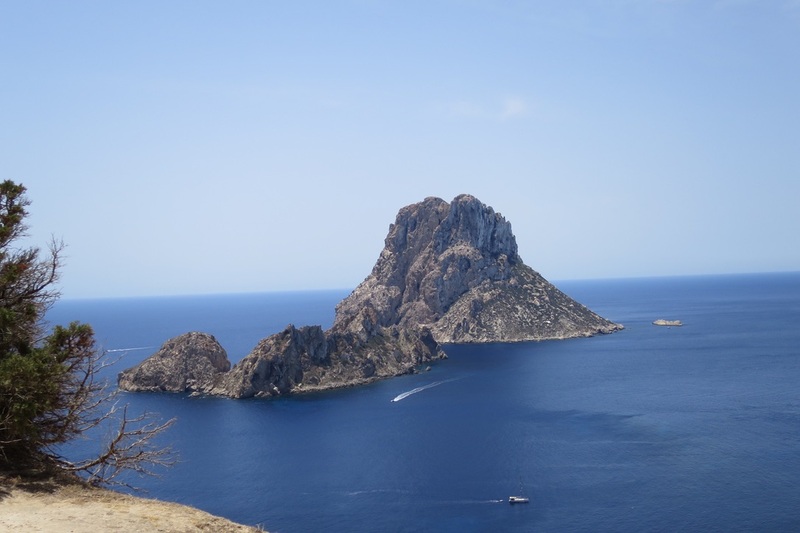 Looking at Es Vedra from Cala d’Hort or from the watch tower Torre The Savinar gives you a special feeling. First of all because of the beauty of this rock island. But it has something magical as well. I’ve been there several times, and every time again it’s catching me by it’s beauty, and magic spirit. The myths and legends about Es Vedra. There are different kind of stories around this beautiful place. It’s seen as the place that secures the strong energy at Ibiza. ( is this where my Ibiza Vibes are coming from? ) It’s also thought of the holy island of Tanit, the phoenician goddess of fertility. She became Ibiza’s patroness. You will see her statue all across Ibiza. Another legend or myth surrounding Es Vedra is that the tip of the sunken civilization of Atlantis would be in front of Es Vedra. You could only come there by boat or by climbing down the rocks. It’s on my “to do “ list. The population of Ibiza do believe in this and some say they have a pact to tell nobody about the location. That’s why you don’t find any signs to Atlantis. Then there’s the story about Don Francisco Palau. He lived at Es Vedra and he told that during meditations he began to witness some series of powerful visions. Some of the islanders say they feel cosmic forces around Es Vedra. And some hippy’s claimed to have seen UFOs around the island. For many artists it’s a major landmark. The beautiful view at Es Vedra gave them inspiration for century’s. Many of them left their mark at the bay across Es vedra, by leaving drawings at the rocks or sculptures. You could find them at the cave at Atlantis. But first you have to make sure to find this place. Es vedra is a protected nature reserve. You may not climb the rock. There’s a lot of excursions going to Es Vedra. But you can come there as well by scooter or by car. It’s a beautiful place, and I think it’s very special. So I would definitely recommend to go and visit this place. From the beach of Cala d’Hort you will have a beautiful view at Es Vedra as well. Enjoy it….And feel the magic vibes!